Uriah Heep in the States for the first time, with new drummer lan Clarke (from Cressida). They played in a 20,000 seat arenas among US bands Three Dog Night and Steppenwolf. It came the time to a new album. The recording of Look at Yourself made in the Summer of 1971, at Lansdowne Studios. "Look at Yourself brings a solid musical direction", said Gerry Bron. The cover shows your reflection, distorted - Mick Box's idea. The Album includes 'Look At Yourself', 'Tears In My Eyes' and 'July Morning', an epic proportions like Deep Purple's 'Child In Time' and Led Zeppelin's 'Stairway To Heaven'. 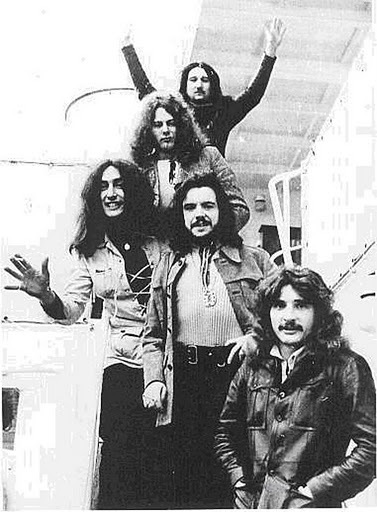 Uriah Heep have success in Germany and in a large parts of Europe; critical - they love to hate Uriah Heep - could not ignore the band. Uriah Heep in State pentru prima oar�, cu noul tobar Ian Clarke (de la Cressida). Au cântat în fata a 20.000 de spectatori, cu trupe de top in SUA - Three Dog Night si Steppenwolf. A venit vremea unui nou album. Inregistrarile pentru Look At Yourself au fost facute în vara anului 1971, la Lansdowne Studios. "Look At Yourself aduce o directie solid�", a declarat Gerry Bron. Coperta discului îti aratã o reflexie (distorsionatã) - a fost ideea lui Mick Box. Albumul contine piese ca 'Look At Yourself', 'Tears In My Eyes' si 'July Morning', o piesã de proportii ca 'Child In Time' a lui Deep Purple sau 'Stairway To Heaven' a lui Led Zeppelin. Uriah Heep are succes în Germania si într-o mare parte a Europei; criticii - c�rora le place sã-i urascã pe Uriah Heep - nu mai pot ignora formatia.